This package includes our Rear Stock Adapter, AR/Tube Upgraded Folding Adapter, longer bolts, and an Adjustable 6 Position Mil Spec Rear Stock. 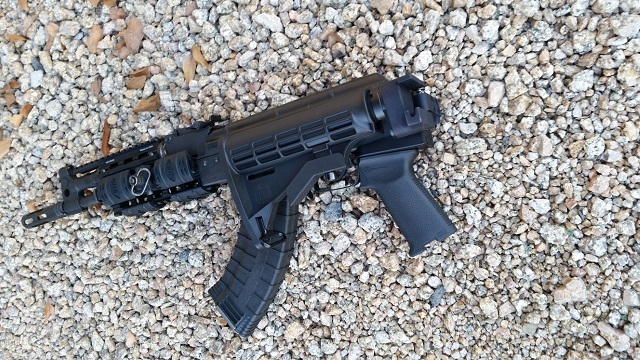 The adapter works with your OEM AK grip or aftermarket type AK grips, we provide both a longer bolt and shorter bolt. Upgraded folding adapter offers upgraded machined parts, machined improved locking buffer tube slot to prevent turning, upgraded stiffer hinge spring, improved, wiggle free locking hinge, slimmer design and harder coating. Also fits Mini Draco and Micro. Mounting instructions included, no drilling or welding. *Measures from 10" up to 13.75" fully extended. Please call with any questions. Fits ALL Draco pistols only.